Picture this - white walls and a red roof, studio cottages and greenery in abundance. You're walking barefoot in soft, wet grass. And after that, you sit and sip on some piping hot tea in a gazebo. Now, are you tempted or are you tempted? 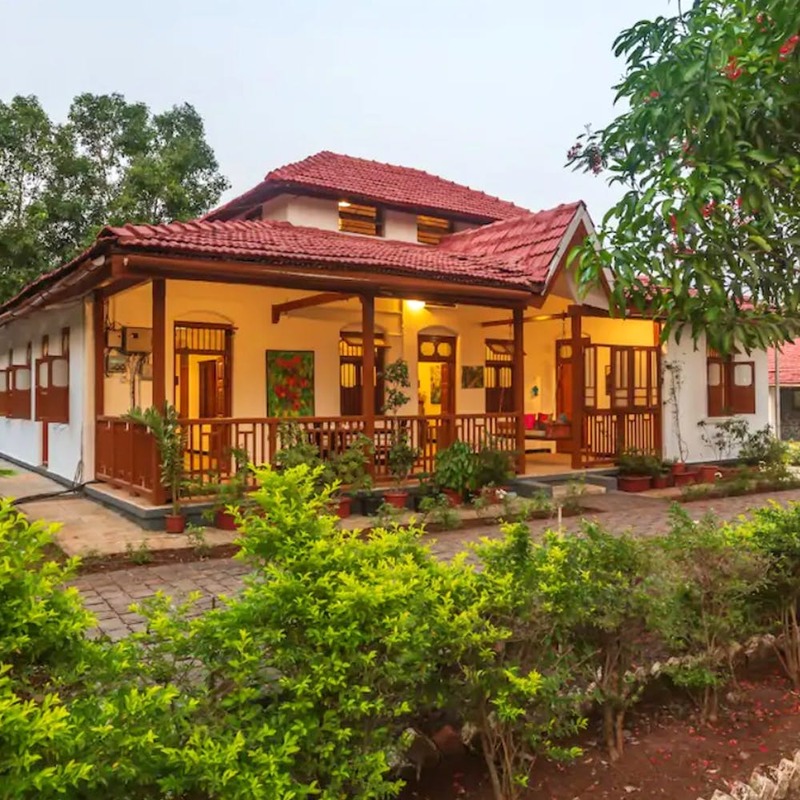 We found this wada-style villa by the name of Ananta, that makes us want to apply for a leave right away and go for a vacay to Kamshet, ONLY to be able to stay there. Sprawling across a 3-acre estate, Ananta Villa, with a capacity of four people, is a 3-bedroom farmhouse with two main villas a loft area, and a studio cottage. The property comes to life because of how its simplicity in terms of interiors. Muted wall colors with paintings made by the owner herself, adorn the villa. There is a humongous garden which hosts trees like mango, chiku, coconut and jamun. You can take a stroll under the canopy of these well-maintained trees and admire the beauty of different varieties of colorful flowers. There is a full-time caretaker to your rescue, and if you're worried about what to eat, let us tell you that all meals are home-cooked using fresh ingredients from the villa's very own yard. Things won't get fresher and healthier than this. So, when are you escaping the hustle and heading to this peace-inducing property? The cost per night is slightly on the higher end, for INR 10, 500 per night. But it can accommodate nine people. So you can choose to come with your group of friends or family, and then go dutch to save up!